twingle mommmy: Catch A Character Giveaway 5 Winners! Catch A Character Giveaway 5 Winners! I have an exciting opportunity for all the parents out there who want to share the magic of the Easter Bunny this year. You can "catch" the Easter Bunny in the act this year and show it to your kids. Your photo will be ready after three simple steps. You go to their website I Caught the Easter Bunny and upload a picture from your house or yard. You can then choose different Easter Bunnies to put in the picture. You can also choose to add a border, but make sure it doesn't cut off the important part of your picture. Then you save it to your computer and print it out. Super Easy! 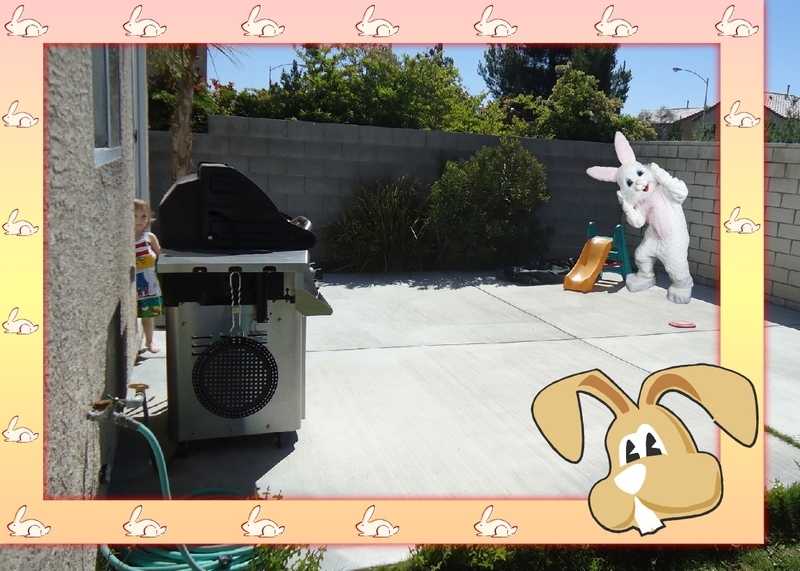 I love that you can make the magic of the Easter Bunny come alive for your kids. Think about how excited they'll be to see the Easter Bunny in their house or yard. I used a picture of our patio since that is where the Easter Bunny is going to leave their present. You can buy a picture for yourself through the website here. Enter the code BUNNYHOP25 for 25% off. FIVE lucky readers will win a photo! They are being extra generous this holiday season. You must be a follower through GFC. Leave me a comment if you already are, this must be done before other entries will be considered. This giveaway is open to US residents only. Giveaway ends on April 23 at 6:00 PST. The winner chosen from random.org. Please leave your email in your comment if it is not part of your public profile. The winner will be notified by email and I will provide the promo code so you may start your picture right away! You've been awarded with the Versatile Blogger Award. Sign me up if I'm not too late! Now follow you on GFC!